A great display by the Ruan girls on the clubs first A championship game in years saw them come out victors on a score line of 6:10 to 1:3. Both sides began the match at high intensity but Ruan with the aid of a breeze in the first half were the first to score and then settle into the match. Ruan added two further points before Inagh-Kilnamona mounted their first real attack, being unlucky to see the ball rebound from the post which was then cleared by the alert Ruandefence. Ruan add a 4th point before the next home team attack again ended with the ball hitting the post from a tight angle and going wide. Ruan then began to squeeze the game into the home team’s end of the pitch, having the first ball to hit the net disallowed as a square ball. However the belief was raised by that attack and 2 minutes later the first goal was scored following a ground based battle in front of goal. With the breeze and the pressure from Ruan the home team were struggling to get the ball out of their own half, while the visitors were able to return the ball to the danger area with more ease. The next 2 goals for Ruan came from long range pucks finding the net. Taking advantage of the elements Ruan drove hard for the final few minutes of the half marking up 2 further points and a scrambled goal following a save by the keeper. With the swapping of ends for the second half, a fight back by the home team was expected, however the desire from the Ruan girls came to the ascendancy and mired the area of play between the two 45 meter lines for long periods which ran down the clock, depriving Inagh-Kilnamona of much time in the danger zone. However the home team forwards and the visitors defence were seeing much more of the action. The home team did show some fine play and tried to force their way back into the match, applying pressure which eventually lead to them scoring a goal and 3 points in the 2nd half. However even with fewer opportunities the extra space afforded to the Ruan forward line saw them able to run at the defence, notching up a further 2 goals and 3 points to close out a well-deserved win. Meabhdh Casey, Mya O’Malley, Emily Whelan, Aimee Mc Donagh, Aine Jones, Sinéad Hastings (Captain, 1.0), Niamh Glass, Aoife Anderson (0.3), Aisling Moloney, Neasa NíLachtnáin, Neasa Ní Ainiféin (2.3), Kate Forde (0.4), AoibheMoran, Aoife Glass (3.0), Grainne Wynne. Subs: Alannah Mulqueen for A Moran, Summer O’Brien for N Glass, Saoirse Barry for G Wynne, Alanna Bolger for N NíLachtnáin, Ella Forde for M O'Malley, Amy Gibbons. The Ruan Comogie club, with agreement from the NeilanFamily, sought to honour the memory of Janet Neilan for her efforts so generously given to the benefit of our club over many years. The opportunity to sponsor a county competition was available and deemed an appropriate memorial. Therefore the inaugural Janet Neilan Memorial Feile C Competition was hosted by Ruan on Saturday 29th April. The day saw 2 very high standard semi-finals play in a very competitive and sporting manner. The Banner girls had a 2 point victory over Broadford, while Ruan had a more comfortable margin in their win over Cratloe, 3:8 to no score. The previous weekend Ruan qualified for the semi-final with two hard fought wins in the qualifying round held in Tulla. The final between Ruan and the Banner, being a rematch of a qualifying match, was a spirited competition where the teams were familiar with their opposition. With deteriorating weather conditions, a constant cold hard breeze blowing across the pitch, slightly favouring the visiting team in the first half, and a goal each as the half time score,the game was finely balanced. However the Ruan girls were on top in all position on the pitch and the Ruan defence werenot allowing any scoring chances, the tenacity of their play and desire to compete was a joy, seeing them win any loose or broken ball. The banner goal came from a melee of ground hurling in the large square after 5 minutes from the start, however from that point on the Ruan goal never looked in danger. With 4 minutes to go in the 1st half the 4 goal hero, Aoife Glass, got her 1st goal of the final. This settled the Ruan team which allowed them play with more flare when they took to the pitch in the 2nd half. The creative play from the midfield and half forwards set up the many scoring chances for Ruan, which in the end saw Aoife get 3 goals in the 2ndhalf. The breeze did impact the game making point scoring near impossible, so the final was a very different game to the semi-finals where point were the main fair. The final score Ruan 4:0 to the Banner 1:0. When the game was over the Nielan Family were on hand to present the trophy in memory of Janet, to the winning and jubilant Ruan team. A proud day for Ruan, for both winning a county title, and for honouring one of their own in an event enjoyed by all attending. Well done and congratulations to the U14 girls. The Junior team played their last game of the North Munster League when they hosted Knockshegowna from Tipperary on Friday last. They ended their campaign on a high note with a win on a scoreline of 4-13 to 2 goals. Afterwards refreshments were served in Purcells. After gaining valuable experience whilst partaking in this league, the team will now focus on preparations for the Championship which gets underway in August. On Sat last, 12 U10 camogie players took part in a blitz hosted by neighbours, Corofin. Unfortunately, two of the participating teams were unable to travel so Ruan played two games against hosts, Corofin. A great mornings camogie was had by all involved, aided by the sun when it appeared, and refreshments were provided afterwards by Corofin. A number of U18 Ruan girls are currently in training with Corofin under an assistance arrangement. Their matches kick off mid July and they will take part in the U18B division. On the county front, Lauren O'Donoghue lined out at wing forward when the Clare U16s took on Dublin on Sunday last in Clooney. Unfortunately on the day the Dubs took the honours. This concludes the county's involvment in this series. 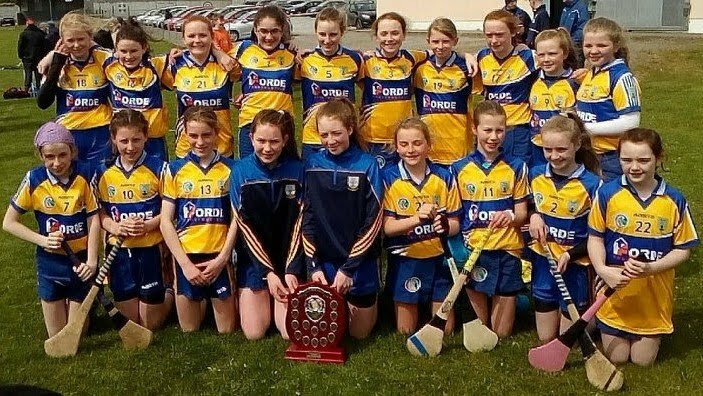 Eimear O'Brien is on the Clare U13 panel and they are due to take part in blitzes against Dublin, Galway and Tipperary in the coming weeks. The club is also represented at U14 level by Louise McDonnell and Roisin O'Loughlin whilst training has resumed for the U15 panel of which Emer Neilan is a member. It is great to see so many budding camogie players being recognised at county level and a great experience for the girls involved. Busy few weeks on the Camogie Scene. The club hosted a very successful U10 blitz on Saturday 2nd June. Participating teams were Sixmilebridge and Kilkishen. The U8s will be taking part in a blitz hosted by Inagh this Saturday 16th June. The Under 13s have qualified to the 13C Shield Semi Final and meet neighbours Corofin this will take place on Monday 18th June at 8pm in Ruan . The Junior Team have played the following games 1st June defeated by Eire Og Ennis on their opening game. On 8th June well deserved win giving them a boost against Sixmilebridge 2-1 and Ruan 3-8. On Friday 15th June a home game, the team will meet Tulla at 8 O clock start at Ruan pitch. On Friday 22nd June Ruan will travel to Tipperary and play against Eire Og of Nenagh. Best of luck to the girls and all your support welcome. The club would like to thank everybody who supported, so generously, their recent Annual Church gate collection. All funds collected will be used in the development of underage and adult camogie in the community. Eimear O Brien & Laura Neilan represented the Ruan club at U13 Level. Training for the girls continues on Thursday and Friday evening for this group at Fr. McNamara Park, Ennis. U15 County Camogie - Emer Neilan and Jessica Healy are currently training Friday evenings and waiting on the call for the panel selection. all players to be in Killanean Pitch for 6.30 p.m. Under 16 C League Ruan against Killanena, Ruan having held good team effort lost out on a score line of 7-6 to 1-5 scores coming from Emer Neilan and Lauren O Donoghue. After a well-contested and sporting game, Ruan bowed out of the junior camogie league when they lost out to a more experienced Feakle team by 1-6 to 3-9 on Saturday evening 21st April 2012. The girls, who were performing at adult level for the first time after an absence of some seven years, can be very proud of their never-say-die performance. They will now continue preparing for the junior championship that takes place in August. Meanwhile, the team hopes to participate in the North Munster League, an initiative run through the sports office of Limerick Institute of Technology. This league is run during the month of June, finishing in mid-July. If there are any camogie players that would like to join, new members are always welcome. In the second round of the U-16 C League, Ruan went down to Clarecastle on a scoreline of 3-6 to 5-7. Scores for Ruan were Louise Mc Donnell, Lauren O’Donoghue and Emer Neilan. After a well contested and sporting game, Ruan bowed out of the Junior League when they lost out to a more experienced Feakle team, on a scoreline of 1-6 to 3-9. The girls,, who were performing at adult level for the first time after an absence of some seven years, can be very proud of their 'never say die' performance. They will now continue preparing for the Junior Championship which will take place in August, meanwhile, the team hopes to participate in the North Munster League, an initiative run through the Sports Office of LIT. This league is run over the month of June, finishing in mid-July. If there are any camogie players that would like to join, new members are always welcome.